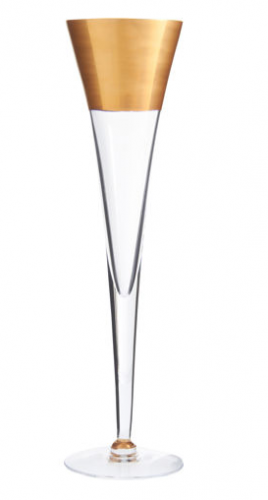 Each year I update this post discussing the age old champagne dilemma, coupe or flute or even tulip with some new suggestions! I have cited Seth Box, director of education for Moet Hennessy USA, before, who, in the New York Times, had discussed his preferences. Not only did he voice his opinion (which of course I agree with) that Americans drink too little champagne but he also had strong thoughts about what glass to serve it in. For modern he choose the fabulously sleek Inside Out glass by AMT studio, now a staple at the MoMA store! And for a retro look, he chose the Stork Club glass by New York First Company, which is not only sturdy but incredibly reasonable. 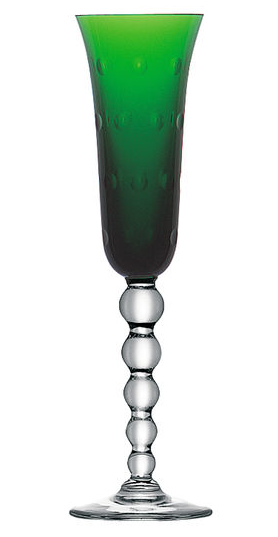 I own the Dom Perignon by Baccarat, a timeless classic. It’s clean elegant lines are always in style and go with any tabletop design. 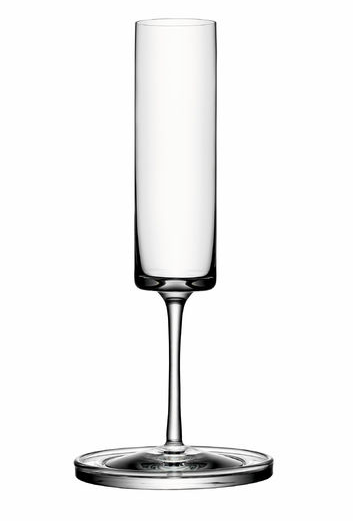 But I am currently obsessing over the amazing Puiforcat sterling champagne tumbler that I recently wrote about. Their champagne line also includes a sterling tray, a champagne glass of Saint-Louis crystal with silverplated stem and a dramatic silver champagne dagger for especially elegant occasions. A lovely way to add a little color of the year to your tablescape would be with the Saint-Louis Bubbles, designed by Teleri Ann Jones. This famous French manufacturer, now a part of the Hermès family, has a rich heritage and each of these flutes requires up to five days’ work, involving the skills of eight craftsmen to produce the shape and five more to complete the cutting. It is available in clear or a virtual kaleidoscope of colors. Even though this Bacchus champagne tumbler by Theresienthal was designed in the 19th Century by Henriette Steigerwald, it walks the fine line between traditional and modern style. The rosettes and beading on this design, available in six colors, including our nod to the color of the year, are inspired by glasses from Roman and Middle-Age glassware, reflecting the Romantic aesthetic. I love the incredibly detailing. I inherited a set of Bacchus in other shapes that I just adore. You can see the water glasses on my Christmas post. 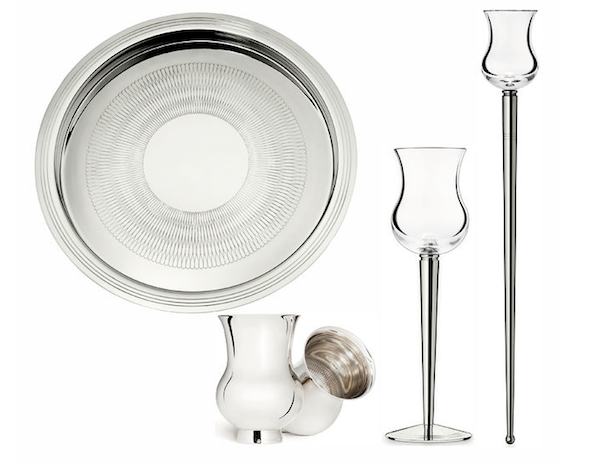 And I am loving the new Waterford Mixology collection that debuted in the spring. These stylish coupes are available in four designs – talon red, neon lime green, circon purple and argon blue for setting your table in with colorful panache. William Yeoward, always one of my favorite glassware designers, offers a variety of stunning options. This year, I am featuring his festive Alexis champagne flute. The palms are completely hand cut and would obviously be especially perfect in a warm weather locale. 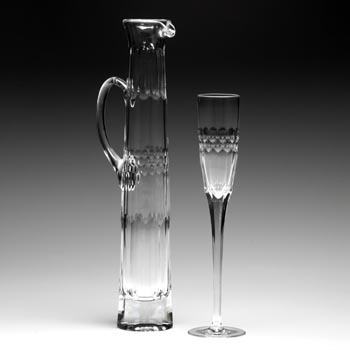 And his tall stately Athena flute can be accompanied by the incredibly stylish champagne jug, a design from the mid 19th century. With a narrow neck, there is little fear of losing the bubbly essence. 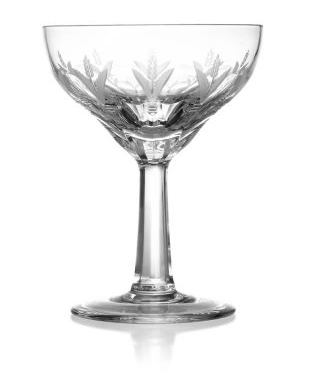 The Eleanor champagne coupe is based on an antique original with hand cut leaf motif. With gold accessories all the rage, Marc Blackwell’s chic Northern Hemisphere flute would work with a modern or traditional tabletop. And for clean contemporary lines, there is Karl Lagerfeld’s line for Orrefors. 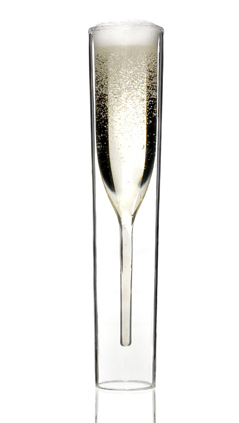 Available in black, white or clear, the champagne flutes cleverly come with matching coasters. 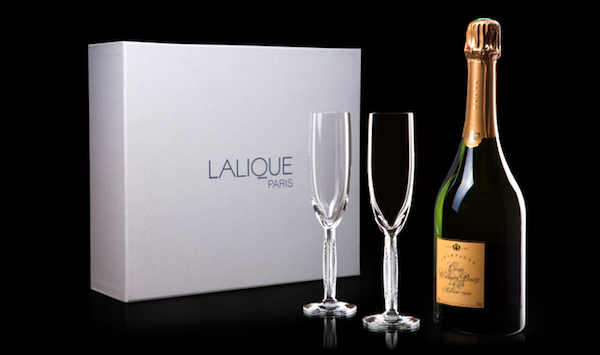 If you are looking for a very special gift, either for yourself or a lucky friend, Lalique has partnered with Deutz Champagne to create a box including a bottle of the Cuvée William Deutz 1999, created in tribute to the founder of Deutz champagne, and two Lalique Diamond champagne flutes, so named because of the dazzling effect the faceted stems impart. This entry posted in design, food and drink, gifts, holiday. 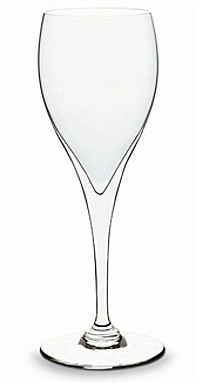 Entry Tags: champagne coupe, champagne flute, champagne glass Bookmark the permalink. Actually not any of the above glasses is the ideal champagne glass. Nowadays you are supposed to drink champagne according what it is made of. That means that a champagne based on Pinot Noir should preferably be consumed out of a Pinot Noir glass and a chardonnay based champagne out of a chardonnay glass. If you don’t have a grape specific glass a tulipshaped glass is to prefer. If you have nothing of the above use a wellsahped redwine glass. 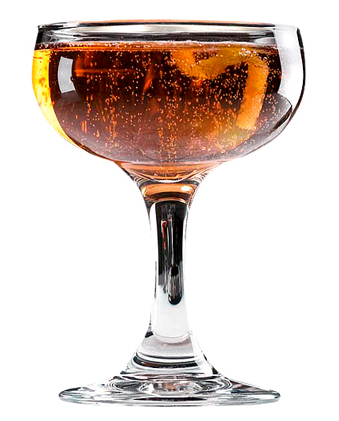 Flutes and coupes are a complete disaster both for the nose and the taste, so please use these glasses for something else. To enhance your experience even more; carefully decant the champagne before drinking! That’s the most silly thing I’ve ever heard!!! I have drunk Champagne with friends who are producers in the Champagne for years! You serve a glass that you love no matter what the style! A vintage Daum glass is nice or whatever you feel like. And decanting? This is total craziness! Spend some time in Reims or Bouzy! We still use our flutes since we were given twenty glasses from Tiffany’s as a wedding present and 27 years later we still have every single glass. If I were to ever change I would go with clean lines like the ones from Karl Lagerfeld’s line. This was fun! I absolutely adore tabletop and your posts on this topic are always “keepers.” The Bacchus champagne tumbler is hands down my favorite! Cheers and bubbles to a happy new year! As a champagne / sparkling wine enthusiast (read: junkie), this was really interesting! All of your picks are so perfect, Stacey. Especially love the Facet by Lalique, since drinking the bubbly always makes me feel a bit from another, more civilized and elegant time. Curious…what do the experts say on drinking right out of the bottle? Cheers! Great post! I love the Saint-Louis Bubbles in that green! Sometimes you can pick up nice pieces at the Hermes sale! I unfortunately broke some from this brand, sigh. Love this post and all your choices! glad to know that Waterford has a new Lismore. That is my crystal. Of course, I love to use a collection of different Champagne glasses on New Years Eve so I might have to invest in a couple of these! Happy New Year Stacey! I never understood how the flute glass became THE champagne glass overnight in the 1980s. Was there some some meeting of all glassware companies? I don’t care for the flutes. Champagne, due to the bubbles, should be drunk fairly quickly and not nursed. It will get warmer and lose some fizz. 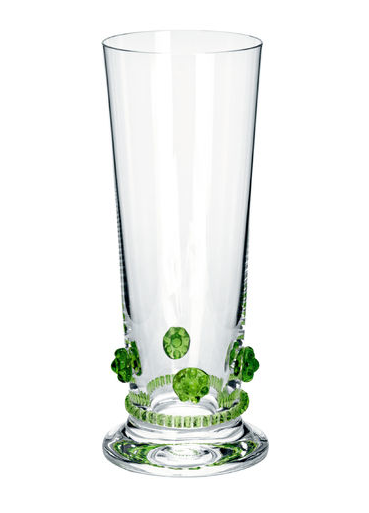 Plus, a flute glass requires one to tip the glass higher as though you were drinking from a beer bottle. 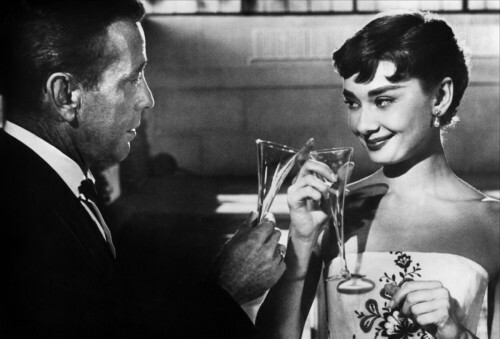 You can’t gaze lovingly at your partner while both are sipping together. To go even further, if you intertwine your arms with your lover and both try to tilt back a flute glass, good luck. Ridiculous. 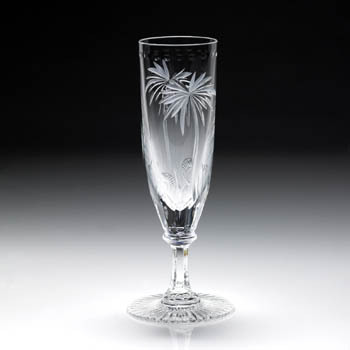 I do have some inexpensive flutes that go with a pattern but they have flared rims which minimizes having to tilt the glass so high. 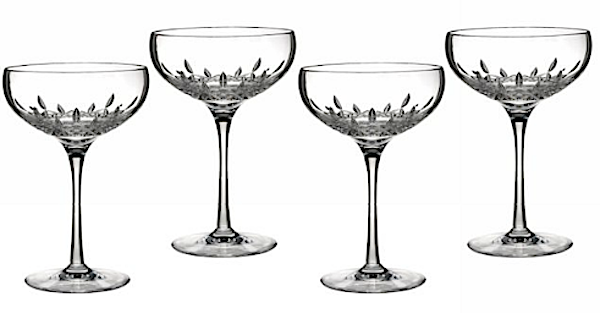 I’m still looking for coupe champagne glasses with a slightly flared rim from an earlier era. Check out the Lobmeyr Ambassador coupe. It retails for $150 and is available at Bergdorf’s in NYC. Look on ebay. I just bought 6 coupe Galway glasses for $50 and 24 German coupe’s from the 1920’s found in an attic, never used! I’m putting them out for my Christmas Open House party and hope everyone has a good time and I won’t care if one or two break! Love them! ……yes, I have better Crystal too but the point is the presentation! I am an avid collector of crystal. When it comes to champagne stemware I have both coupe and flutes. I have cut, etched, hand blown, single stems to dozens. Dime store finds to 5th Avenue are in my collection. Collect what you want! 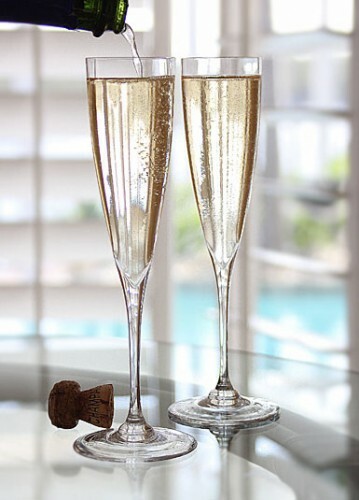 Champagne is to be enjoyed, whether it is in a modern day flute or in an exquisite 19th century coupe. Wonderful post ! As i was searching the best champagne glass for my sister’s wedding, i got through your blog and ended up my decision on flutes. They are quite classy and elegant. Example described here is quite astonishing. Glad you shared this post.